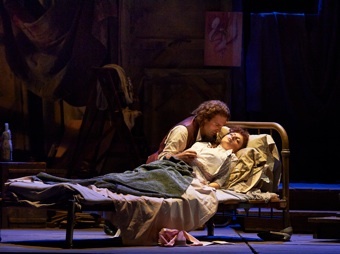 Puccini’s La Bohème is generally staged as if it were nothing more than a sentimental tearjerker. What else are to make of an opera where a poet and a tubercular seamstress fall in love in Act 1 and she dies of her illness in Act 4? Director John Caird, most famous as the co-director of the original production of Les Misérables, has taken a fresh look at this warhorse of the opera repertory. The new COC production, a co-production with Houston Grand Opera and San Francisco Opera, finds more substance in the opera than any previous production I’ve seen and in so doing forces the audience to re-evaluate its preconceived notions of the work. Most productions of Puccini’s 1896 work about starving artists in love have emphasized the theme of love but neglect the theme of art. Caird redresses this tendency through a concept production that keeps the theme of art constantly before our eyes. Designer David Farley has constructed the sets for all four acts out of an assemblage of paintings on canvas. For the garret where the four male artists live, all we see are the backs of the canvasses with the wooden stretchers and crossbars looking like the crazy moulding and wainscoting of what seems like a jerrybuilt space for working and sleeping. The sets for the scenes at the Café Momus and at the city gates are composed of the painted sides of the canvasses and portray the locations as if refracted by a collection of clouded mirrors. Caird has Marcello the painter painting a canvas on an easel of the Café Momus in Act 2, but in Act 3 Marcello is discovered painting a large picture of a tavern which is, in fact, part of the tavern itself with rectangular lights from behind the canvas suggesting windows. The effect deliberately plays with the distinction between illusion and reality. Even the border and legs surrounding the set look like canvas drop cloths. The impact of this visual emphasis on art and artifice is to highlight all the references to these subjects throughout the libretto. In Act 1 when Rodolfo burns his play to keep warm, he puns on the burning of his scenes of burning passion (“In quell'azzurro - guizzo languente Sfuma un'ardente - scena d'amor”). In Act 2, Schaunard refers to Musetta’s attempt to make Marcello jealous as “la commedia”. In Act 4, Colline’s farewell to his empty coat mimics Rodolfo’s farewell to the dying Mimì. Only in this production has Rodolfo’s decision to burn his play sounded so much like a foreshadowing of the action: “No, in cener la carta si sfaldi e l'estro rivoli ai suoi cieli” – “No the paper will unfold in ashes and its muse return to heaven”. Caird’s direction and Farley’s design reveal the four male protagonists as men who spend their lives creating illusion and, indeed, use illusion to stave off reality. Only when reality impinges on their work, like the chill air in Act 1, are they forced to stop. Mimì’s entrance into the artists’ midst represents a more ineluctable reality than the cold – that is, death. This is a reality that shakes all the characters to the core. Yet, even here, Caird shows that death can be transmuted to art by his directing Marcello try to sketch as rapidly as he can a picture of the just deceased Mimì. Seeing this image we have to recognize that Puccini has done exactly the same thing by means of this opera. While the production concept is enlightening, its execution could have more panache. Farley’s design succeeds in de-glamourizing the notion of an artist’s garret, but why are such different locations as those in Acts 2 and 3 cast in the same dull, grey-grey colour scheme and why do they have to look so drab? Farley’s set has one important advantage over the Wolfram Skalicki’s set for the COC’s previous production that premiered in 1989. Farley’s set allows the change of scene from Act 1 to 2 and Act 3 to 4 to occur almost instantaneously, thus avoiding the long waits between acts in a semi-lit auditorium that Skalicki’s set entailed along with the resulting break in the flow of the music and storytelling. Caird’s direction does not foreground the Rodolfo-Mimì story at the expense of the Marcello-Musetta story, as is usually the case, but rather keeps the two in balance with the bitterness of the latter counteracting the sentimentality of the former. On opening night, the male singers were clear winners over the female singers. As Rodolfo, Dimitri Pittas has a powerful, ringing Italianate tenor that conveys all the passion of his character. In Caird’s view Rodolfo is almost as much of a lost soul as Mimì until they find each other, and Pittas wonderfully captures this change in Rodolfo from aimlessness to purpose. As Mimì, Grazia Doronzio has a lovely though smallish soprano. She annoyingly “saves her voice” during the first two acts, even in Mimì main Act 1 aria, waiting to deploy fully in Act 3. She characterizes Mimì as fragile and bewildered but not much more and seems noticeably less comfortable on stage than the rest of the cast. As the extroverted Marcello, Joshua Hopkins is a perfect foil to Pittas’s introverted Rodolfo. Hopkins commands a strong, velvety baritone and has such stage presence he tends to dominate every scene he’s in. His Musetta is Joyce El-Khoury, who, like Doronzio, also has a lovely though smallish soprano. Unlike Doronzio, El-Khoury is a fine actor and brings off Musetta’s flirtatiousness with such aplomb in Act 2 that it makes her turn toward earnestness in Act 4 all the more effective. Christian Van Horn has a wonderfully deep, chocolaty bass and captures just the right seriocomic note for Colline’s farewell to his coat. Phillip Addis has a lithe baritone and achieves as much through his fine acting as his fine singing. Thomas Hammons is rather too keen to grab the spotlight as a weak-voiced Benoît but doesn’t make as much of Alcindoro as he could. Readers should note that Michael Fabiano sings Rodolfo on October 16, 19, 27, 30 in alternation with Eric Margiore (October 18, 22, 25 and 29). Joyce El-Khoury sings Mimì (October 16, 19, 27 and 30) while Simone Osborne sings Musetta (October 16, 19, 27 and 30). Phillip Addis sings Marcello (October 16, 19, 27 and 30), while Tom Corbeil sings Colline (October 16, 19, 27 and 30) and Cameron McPhail sings Schaunard (October 16, 19, 27 and 30). The constant amid all this switching of cast members is that celebrated Italian conductor Carlo Rizzi conducts all performances. I don’t think I’ve ever heard the score to La Bohème sound as lush and vibrant as it did played by the COC Orchestra under Rizzi’s baton. Rizzi manages to catch us up in the sweep of Puccini’s melodic lines without neglecting the precision of the score’s inner details such as the exquisite interplay of flutes and harp in Act 3. Frequent opera-goers may feel they’ve seen La Bohème too many times to see it again. Caird’s insightful direction and Rizzi’s invigorating conducting show that there is more depth to this popular work, both symbolically and musically, than you have ever experienced before. For newcomers to opera, this is a great place to start. Photo: (top) Act 2 from La Bohème with Joyce El-Khoury as Musetta in pink; (middle) Dimitri Pittas and Grazia Doronzio. ©2013 Michael Cooper.